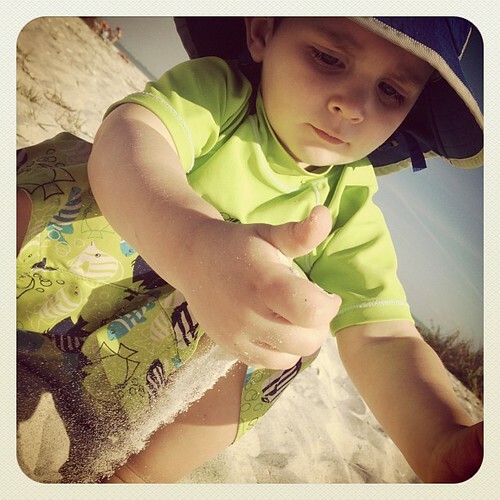 After we'd walked the Sanibel shoreline for about an hour, waves cascading and breaking at our feet, E settled into a soft sandy stretch of beach and began sifting the fine white sand through his fingers over and over again. I sat just inches from my baby boy, watching him, my heart overflowing with love as he enjoyed the beauty, the softness of creation. I needed this day -- I needed the waves to soothe my mind. The warm sun to melt the tension I've been trying to let go. The sand to softly exfoliate the worry that sticks to my heart, trying to cling to it. In that moment, as sand slipped from his small fingers, my body relaxed. I felt a distinct, direct whisper penetrate my heart. More than you love him. More than all the sand on the beach. And, oh, how He whispers that love to my heart through the simple, the beautiful creation He spoke into being. Link up your gleaned moment this week at Jade's! Please be sure to link to your post, not your blog. Your post must link back here or have our button in your post or the link will be deleted.